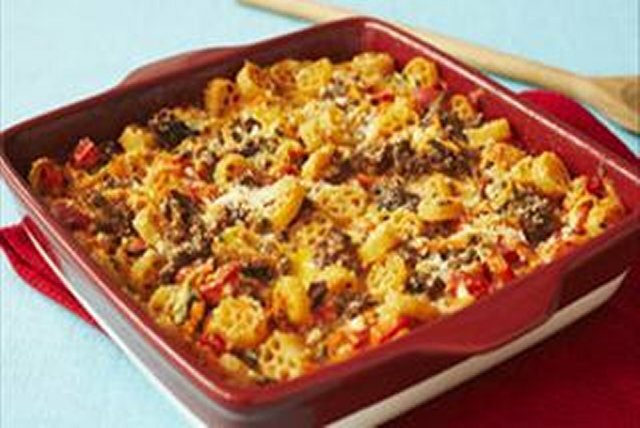 CHEEZ WHIZ adds personality to a pasta bake the whole family will love! Preheat oven to 350ºF. Cook pasta as directed on package. Meanwhile, brown meat in large nonstick skillet on medium-high heat; drain. Add carrots, zucchini, peppers and pizza sauce; stir until well blended. Cook 5 min. or until vegetables are tender. Drain pasta. Add to meat mixture along with the Cheez Whiz; stir until well blended. Spoon into 8-inch square or 9-inch round baking dish sprayed with cooking spray; sprinkle with Parmesan cheese. Prepare as directed, using whole wheat pasta, extra lean ground beef, Cheez Whiz Light Process Cheese Product and Kraft 100% Light Grated Parmesan Cheese. Good news!! You'll save 70 calories, 8 g total fat and 4 g saturated fat/serving, by substituting extra lean ground beef, Cheez Whiz Light Process Cheese Product and Kraft 100% Light Grated Parmesan Cheese.